I bet lots of people will jump all up and down to contradict me, and I bet another bunch of people will be surprised because it doesn't fit with an image they have, but let me say: Writing is actually rather boring. I recently had a stint of about three weeks of heavy duty writing. I mean, really heavy duty writing, from the minute I got up, until as late as I could manage (i.e. when I started to fall asleep at the keyboard). During that stint (anytime I write, actually, but this recent binge is notable because I was off work and went at it for three weeks straight), I ignored most emails and phone calls, I steered clear (mostly) of social media, I declined several invitations, I didn't read the news, surf the net or listen to the radio. 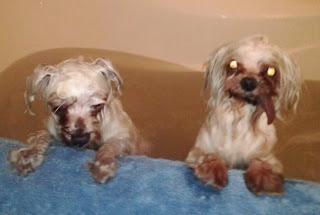 Bella on left, Chico on right... look at that tongue! It's forever hanging out because he doesn't have any teeth (neither does Bella, but she's learned to keep hers in). Each dog weighs about 6 lbs. But I still had to walk my dogs. I live in a condo. So, on each trip out with the dogs, naturally, I'd see neighbours in the hall or on the elevator, and of course, there's the 24 hour concierge in the lobby. Polite chit chat ensued: What's new? How was your weekend? What have you been up to? What do you think about [---] current event? Hey, did you hear about [---] news item? Friend: Oh, how very fascinating... What else did you do? Jill: I deleted the 3rd sentence from paragraph 2 in chapter 6. But then I changed my mind and kept the sentence, only now it's the 4th sentence, not the 3rd. Friend: That's really interesting. Did you do anything else? Jill: I stared into space for about two hours trying to figure out if the change I made on page 67 will affect what happens on page 109. Jill: Then I realized that in chapter 5, I said it's raining, but in chapter 4 - which is the same day as chapter 5, only about two hours earlier - well, I said in chapter 4 that it's sunny. So, I have to decide if I should go back and not make it sunny in chapter 4, or maybe I should get rid of the rain in chapter 5? But then if I get rid of the rain, it won't make sense that my character is wearing rubber boots and carrying and umbrella, so maybe I should keep the rain. Don't get me wrong, I enjoy what I do, or I wouldn't do it. And it is fun to play out dialog in my head, or to imagine new scenes for the story, or to come up with a great plot twist or a pithy character description. But until the book is done and it's actually out there (or at least until you start to show the manuscript to people), it's not necessarily the most scintillating topic of conversation. Writing IS a solitary, stationary endeavour, and it's best done in silence and without distractions. At least, that's the way it is for me.